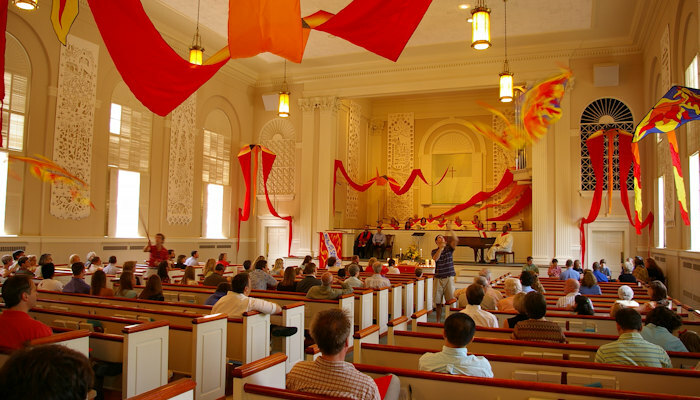 Our early service at 8:30 AM is held in the Chapel (or in Fellowship Hall during renovations). Tessera is small individual tiles used to make a large mosaic. So join us! Dress is casual with coffee available throughout. Contemporary music is led by some talented singers. We hear prayers of the people and participate in a sermon talk-back. 9:45-10:55 AM. Coffee Bar in Chapel. The more traditional “blended” worship service at 11:00 AM is held in the sanctuary, home to our wonderful Schantz pipe organ (two manual and pedal organ with 29 ranks, 23 speaking stops and 1,742 pipes). The adult choir usually provides the special music except during summer break. Many members share their musical talents, from flute, guitar and trumpet playing to the hand bells. The children and youth choirs also lead worship on a regular basis. See many more videos from worship on our YouTube Channel.